If you live in Victorville, California, and you are experiencing any problems with your automobile, your first choice should always be to consult Road Runner Auto Care in Apple Valley, California. We have the tools and training to put your vehicle on the road without worries. Our dealership has been open for more than 3 decades, serving thousands of satisfied customers. We specialize in Land Rovers and transmission repairs with all the certifications to boast. Any issue that you may be facing becomes short work in the hands of our expert crew. All late-model vehicles are equipped with a computer diagnostic system called OBD-II. This On-Board Diagnostics-II system is there to comply with EPA laws which protect our environment. The earlier versions of this system were called OBD-I. The OBD-I platform used diverse interfaces and protocols to retrieve Diagnostic Trouble Codes (DTCs). The DTCs help pinpoint the failures that are causing performance problems and affecting the emissions. In California, the smog check and full function of the emissions system are vital to proving the lawful roadworthiness of any vehicle. In fact, it was the Bay Area smog that was responsible for developing the EPA and its regulations. The initial tasks to improve air quality in major U.S. cities was fulfilled through a number of phases including the switch to unleaded gasoline. Why does your Check Engine Light come on? If your Check Engine Multifunction Illumination Lamp (MIL) is on or flashing, this means that a DTC is stored in the computer. The DTC can reduce the performance of your vehicle and cause it to run in a default fuel-mapping even if you don’t notice any other operational problems. Having this fixed as soon as possible is important if you want to safeguard your Victorville vehicle investment. 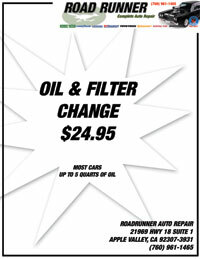 Road Runner Auto Care has the decades of experience helping Victorville residents to decode these cryptic DTC malfunctions without guessing. The thing about DTCs is that they can be very misleading. 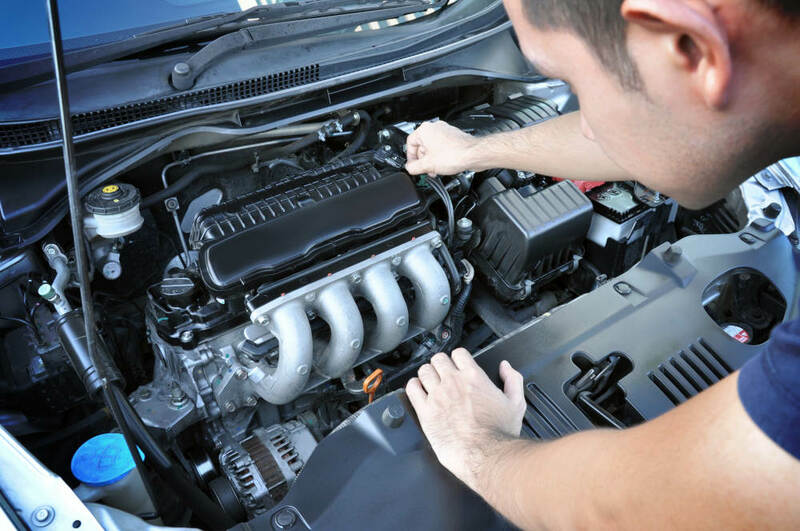 A code can come up signaling that your crankshaft sensor is not reading. But, this code may simply mean that the signal is not being read for a variety of other reasons, not because the sensor itself is bad. Because late-model vehicles are becoming increasingly complex, you should never gamble with what may be wrong and throw parts at a vehicle. Contact us if you live in Victorville or the Apple Valley region. We will be happy to use our sophisticated resources to solve all your automotive problems.